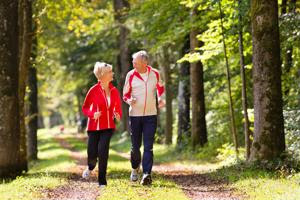 There are many reasons why providers of senior care services should exercise. Why should caregivers engage in regular exercise? If you want to provide your clients with great senior care services, then you'll want to be as healthy as you can be. As a caregiver, you may find that you're more worried about your clients getting physical activity than you working out. However, there are many reasons that you should engage in exercise, and it can help improve several aspects of your life. Exercise can help you control your weight. By engaging in physical activity you're burning calories and keeping excess pounds off. Being overweight or obese can lead to health issues like heart disease and diabetes, which you want to avoid. Being a caregiver isn't always a glamorous job and can leave you feeling a little stressed at times. But when you participate in exercise you'll notice that your mood improves. According to the Mayo Clinic, even a 30-minute walk will cause your brain to release endorphins and leave you feeling happier. When you feel like you just don't have the energy to go on, exercise. It may sound like a contradiction to workout if you're tired, but you'll notice that a short session at the gym can leave you feeling more energized.